Everyone would love to create an array of memories. It’s a familiar story and it usually goes like this! There is a better option to create the slideshow and makes it simple to present on a memorable day. However, you would love to store and burn photos to DVD Mac for a long run. The choices are passing the slideshow online to your friends or saving the slideshow on the personal computer. Don’t you just hate it when the computer occupies more storage when compared to other devices? So, the basic solution is to burn photo slideshow to DVD Mac operating system easily. Wouldn’t it be great if you use DVD? No more storage problem and no more chaos! Make it simple by letting the iPhoto burn to DVD. In this article, let us discuss the burning process of iPhoto burns to DVD on Mac! As a discontinued DVD-creation application for Mac produced by Apple, iDVD allows you to burn QuickTime movies, MP3 music and digital photos to a DVD for future playback on DVD player. So when speaking of burning photos to DVD Mac, iDVD usually comes as the top free solution. Now let's get a quick view of how to make a iPhoto slideshow on Mac. Step 1: Open iPhoto on your Mac and choose the slideshow. You can select the slideshow option from the left side of the panel. After selecting desired photos, right click at any of the blank space of the screen > select New Slideshow. Step 2: Once you are done with the slideshows, select it, then you need to go to the File menu and select the Export option. Step 3: Then you'll get a pop-up window asking you where to save the slideshows, just go to Places tab and select iDVD. Step 4: After that open iDVD software, then choose the slideshow. Step 5: Now insert a blank DVD to proceed with burning slideshow process and visit Open Finder to open the DVD. Step 6: Drag and drop your slideshow to the DVD, you'll see the burn icon as circled in the screenshot. Click it to define its name, speed and other settings, and then press the Burn button to start iPhoto burning immediately. The whole process of burning slideshow to DVD Mac using iDVD is quite easy, isn't it? Note the tutorial goes for any type of DVD standard specification. We hope now you would have a clear picture of burning files to DVD on Mac. Right? Ok, I know what you are thinking! How to make a slideshow on Mac? Well, Wondershare DVD Creator lets you do that too. We are here to help you with proper guidance. The compelling feature will mind the photos in the slideshow by weaving into online. The slideshow is perfectly matched with the templates in professional appearance and thus, it makes easy for you to create a good slideshow with a lot of advanced features. You can trim, add the titles using the move tool extraordinarily. Burn pictures and videos in any format to DVD/Data Disc/.DVDMedia/ISO file. Offer 100+ free static and dynamic DVD menu templates from Movie, Family life to Sport theme. Customize DVD menu by changing background image or music, adding text, adjusting aspect ratio and more. Real-time preview of the created disc before photo to DVD burning. Create Photo slideshow to DVD on Mac with super fast burning speed and high quality output. Toolbox with additional functions including Data Disc, ISO to DVD, Slideshow Maker, Video Editor, DVD to DVD, DVD to Video, etc. Learn the video tutorial to burn photos to DVD slideshow on Windows which has similar steps on Mac. Now, let us focus on the steps to create Photo slideshow in Wondershare DVD Creator. Moreover, the steps won't be difficult and the interface is suitably compatible with all works. 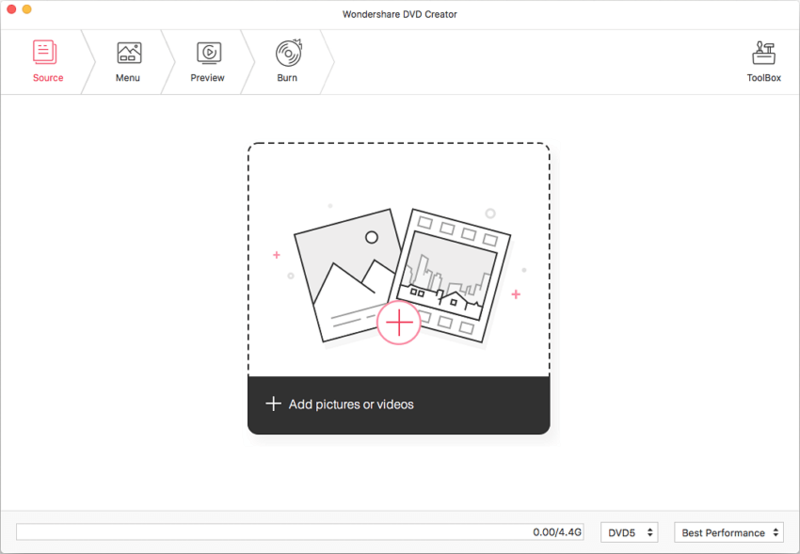 Wondershare DVD Creator has designed the software interface with a clean sketch and makes it simple to follow up the new user. 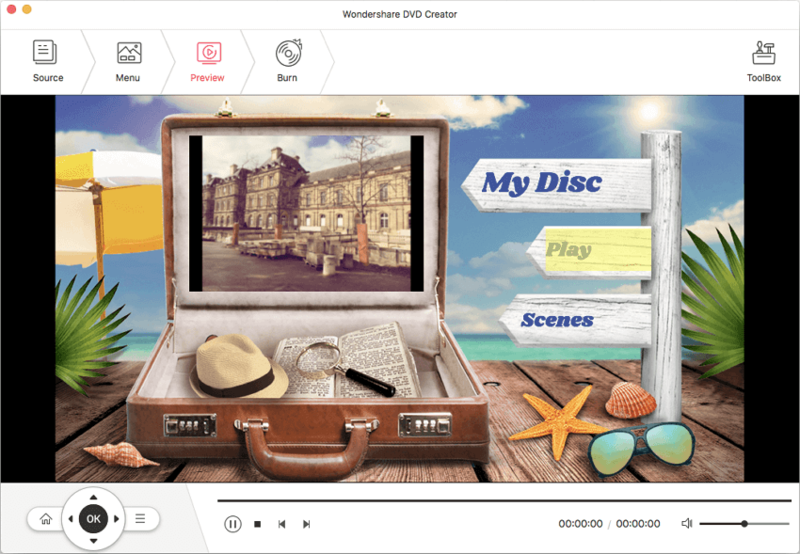 Launch Wondershare DVD Creator and select Create a New Project from the main interface. Import the photos that you want to burn into DVD slideshow by clicking the + button. Or you can directly drag and drop them to the primary interface. Once all photos added, they will be displayed as thumbnails on the left panel. 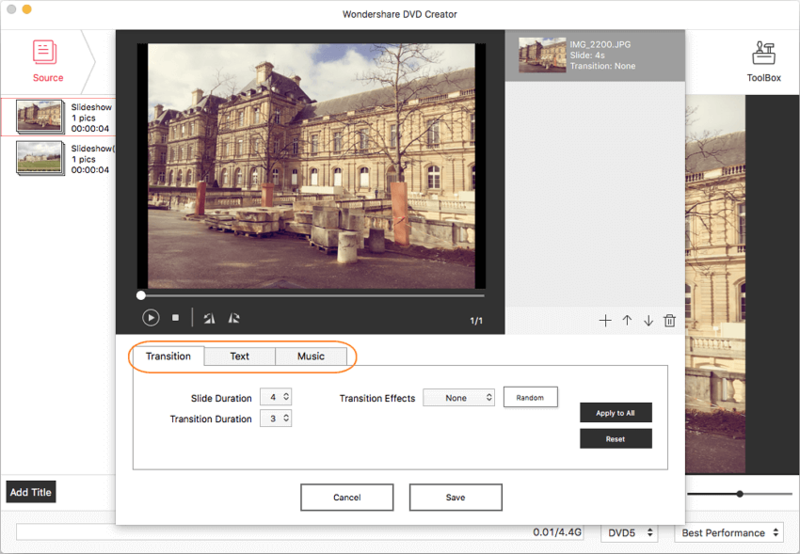 Wondershare DVD Creator provides several editing features for you to enhance slideshows view and appearance, such as transition duration and effects, text, music, etc. You can start editing photos by hitting the pencil-like icon on the thumbnail. Once you are done with image editing, you can choose your desired background templates by going through the Menu option, which offers multiple template choices. Click the icons on the interface to customize background music/image, add text, edit thumbnail, adjust aspect ratio, and others. Before you proceed to DVD burning process, you can click the Preview tab to get a glimpse of your just created DVD photo slideshow. Go to the Burn tab and insert a blank DVD into your Mac. Finish all Burn Settings it provided such as give a disc label, choose burner, set TV Standard, and more. Finally, click the Burn button to initiate photo slideshow to DVD burning immediately. Finally, we have explained the creation of photo slideshow using Wondershare DVD Creator and how to burn photos to DVD. Wondershare DVD Creator has detailed guidance for all the functionalities and it will be easy to use. You may see much software online but they fail to perform the actual actions. When it comes to Wondershare DVD Creator, it’s damn true that the software is licensed properly and trustworthy too. 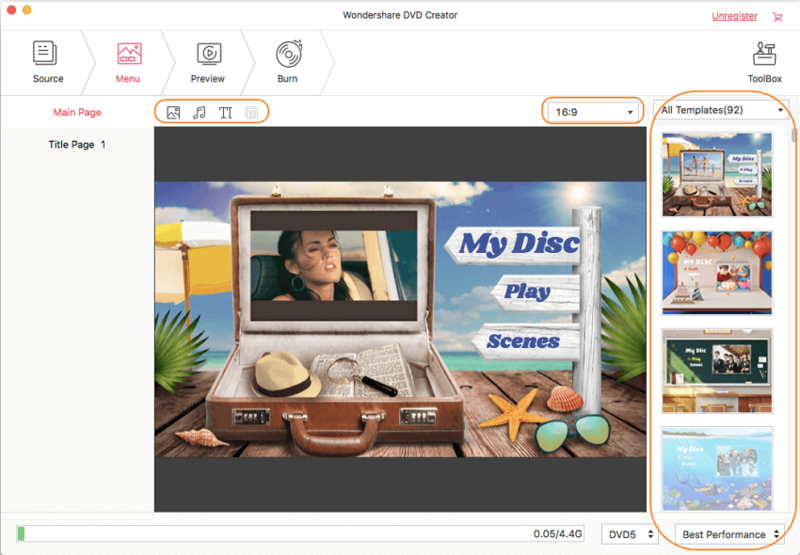 No need of technical knowledge needed to access Wondershare DVD creator.